While most people know about kimchi and Korean barbeque, the food offerings in South Korea are incredibly diverse, and go far beyond these standard dishes. While there’s a tantalizing restaurant every few meters throughout the entire city, it’s street food carts and tents that fill all the open spaces. 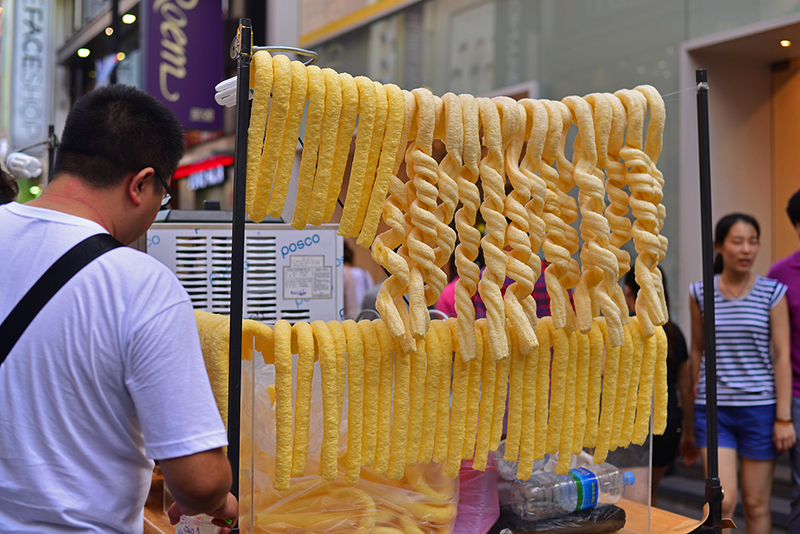 From dried seafood chips and Tteokbokki to ice cream tubes and sugar pancakes, Seoul’s street vendors have a snack for every taste. 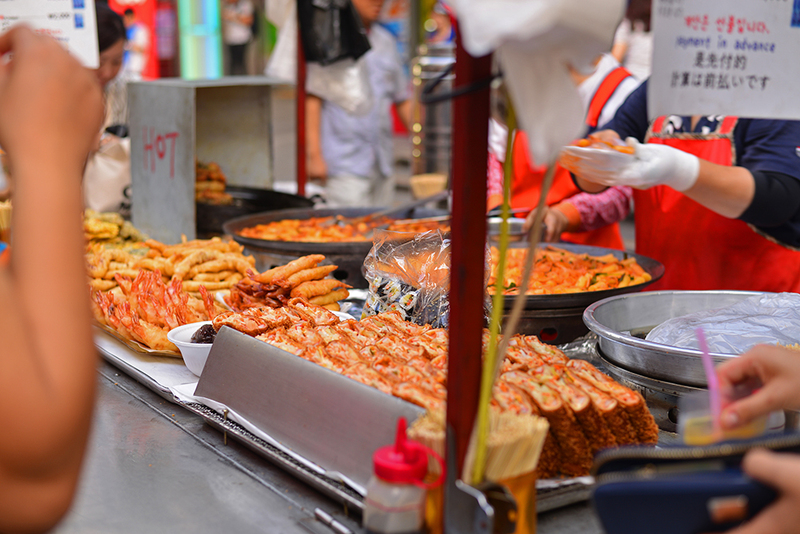 South Korea’s capital has a nearly endless parade of cheap and delicious food. 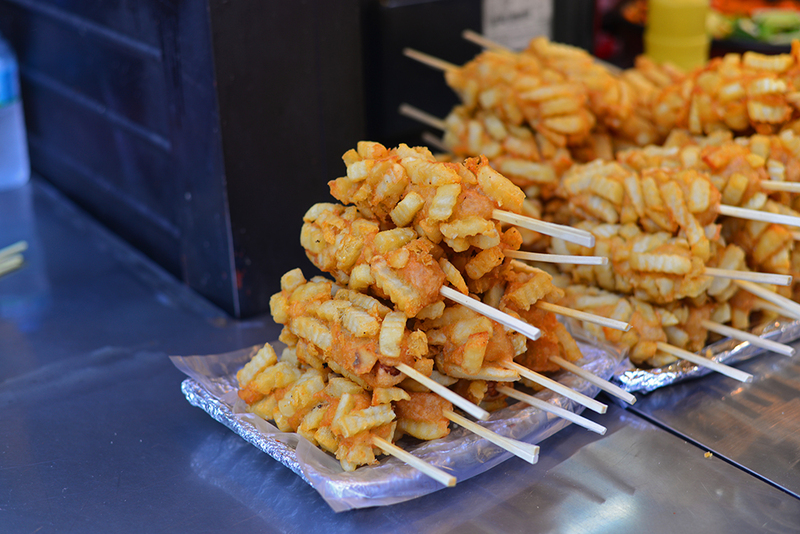 Here are ten unique, delicious and cheap street foods to sample on your trip to Seoul. I didn’t manage to try all of them (I have never been a huge fan of fried pig’s feet), but the ones I did sample were a real works of the culinary art. 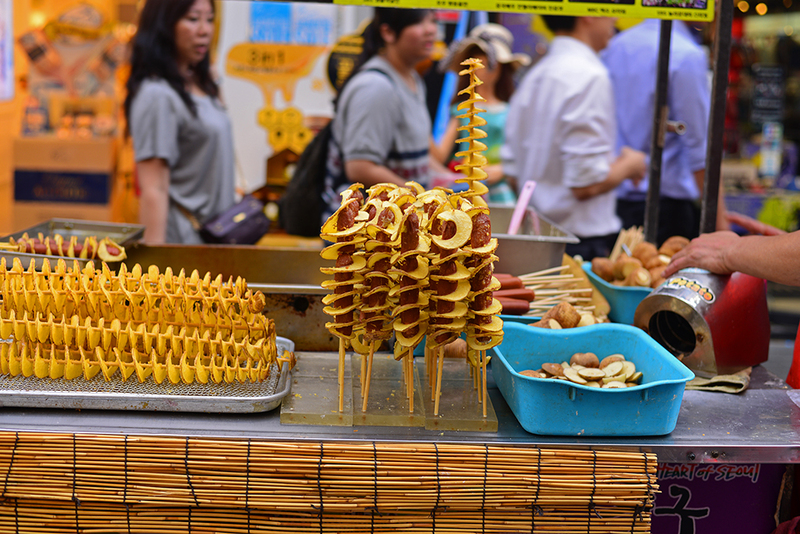 The best places to find a good quality street food are in and around Insadong, as well as other neighborhoods such as Myeong-dong, Jongno-gu and Samcheongdong. starting with something quite different from the filling meals of rice and vegetables you may expect to find around the streets of Seoul. 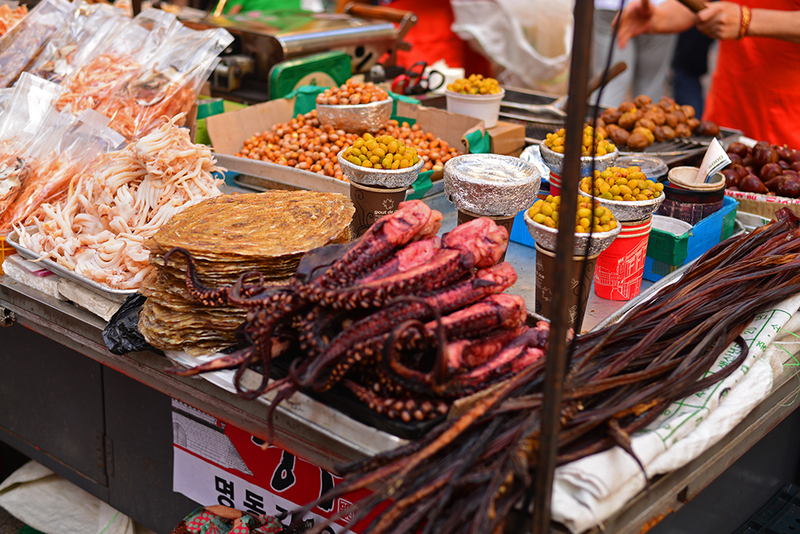 The street food in South Korea’s capital would just not be the same without tentacles of fried octopus and squid. 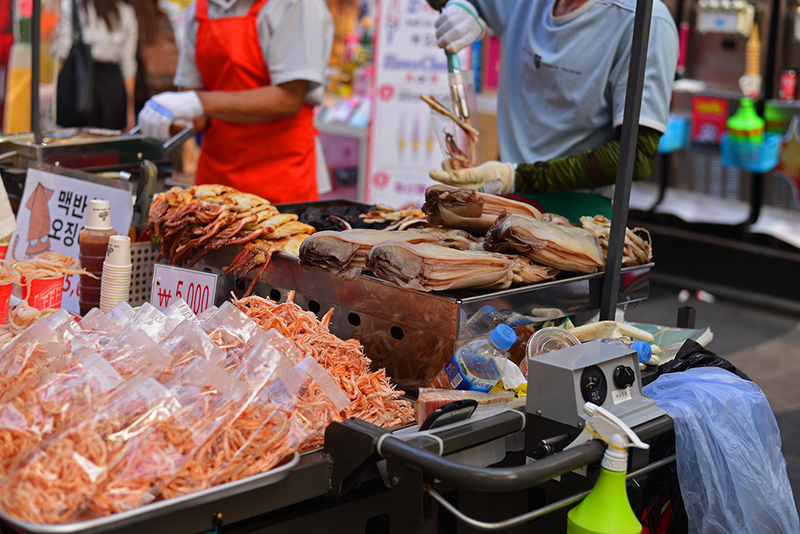 You will probably smell the fresh seafood before seeing the vendor’s cart. One of Korea’s most consumed dishes, the Tteokbokki was originally made with soy sauce. This is Seoul’s most iconic street food. If you’re craving something spicy, look for a food stall serving tteokbokki, with a variety of sauces that range from mild to alarm-fire spicy. The dish is comprised of chewy rice cakes soaked in spicy pepper sauce and comes with a serving of fish cakes. Apparently this is a wildly popular food in Korea. The more “user-friendly” version of Jokbal (pigs feet) can be found around the area of Myeong-dong. 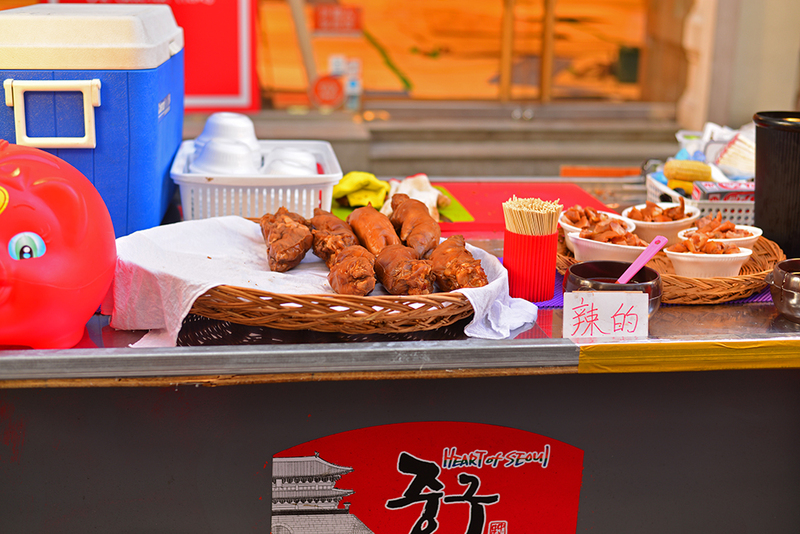 If you feel brave enough to try the authentic Korean flavors of the pig’s feet, head to the Twigim Street in Gongdeok. There you will be able to find some of the most famous dishes cooked with Jokbal. Passing further down the street carts our attention is captured by the strong and sweet smell of baked seafood. Usually sold in pre packed bags, the street vendors will bake the portion you chose on the spot, so that it becomes toasty. You will be spoilt for choice with the options of cuttlefish, octopus or small fish. Let’s move on on my favorite selections from Seoul’s street food. This simple snack is made from a whole potato cut into a spiral and spread out on a long stick. The deep fried goodness is then sprinkled with cheesy or barbeque flavored powder. The snack can be consumed on its own or accompanied by a hot dog. In the second option, the potato is spread out on a hot dog and then deep fried. Perhaps the only thing better than a hot dog is a hot dog coated in deep-fried potatoes.This snack is not designed for the health conscious. It is recommended to eat the snack while its hot, as it looses some of its flavor when it gets cold. This extremely tasty, traditional Korean candy is a mixture of caramelized sugar and baking soda. The two ingredients combined, create a tasty dessert, that tastes like a slightly burnt campfire marshmallow. The dessert is usually formed into round disks or molded onto a stick as a lollipop. The tubes are made from fried dough and injected with soft-serve ice cream. This goodness in an alternative to the over sized ice cream cones you can find in Seoul. Similar to taste, but less messy, the crunchy ice cream tubes are a hit among the tourists. 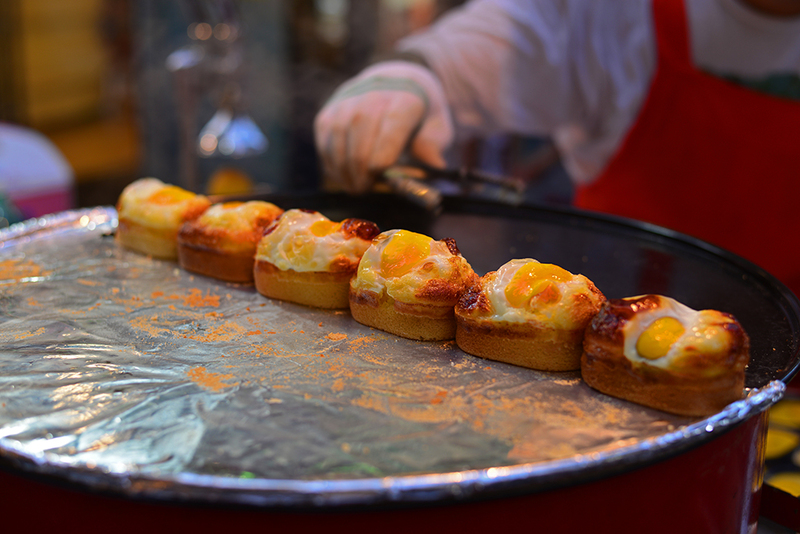 The oval-shaped piece of semi-sweet bread with a fried egg on top can be found at vendors all over Seoul. 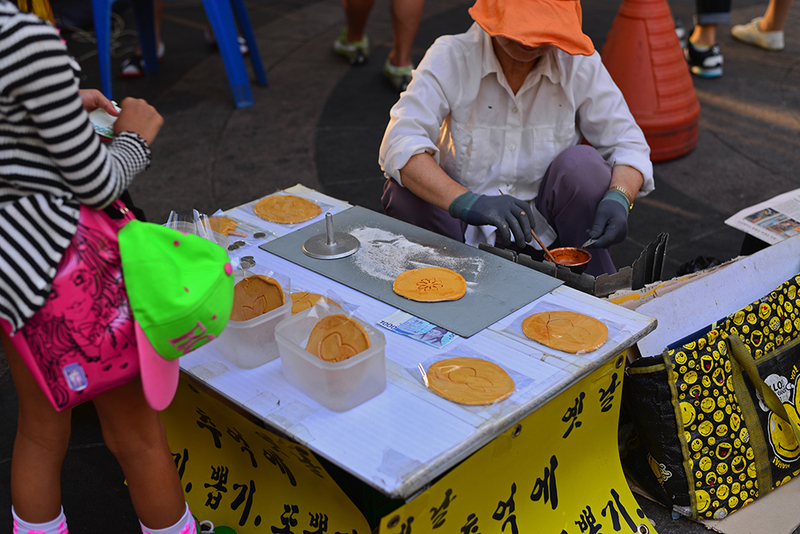 At some places the street vendors use waffle batter instead of bread dough. The outside of this local delicacy tastes like bread and the inside resembles a boiled egg. After all these tasty and delicious snacks it would be a good idea to slip down a bag of freshly squeezed juice with ice. 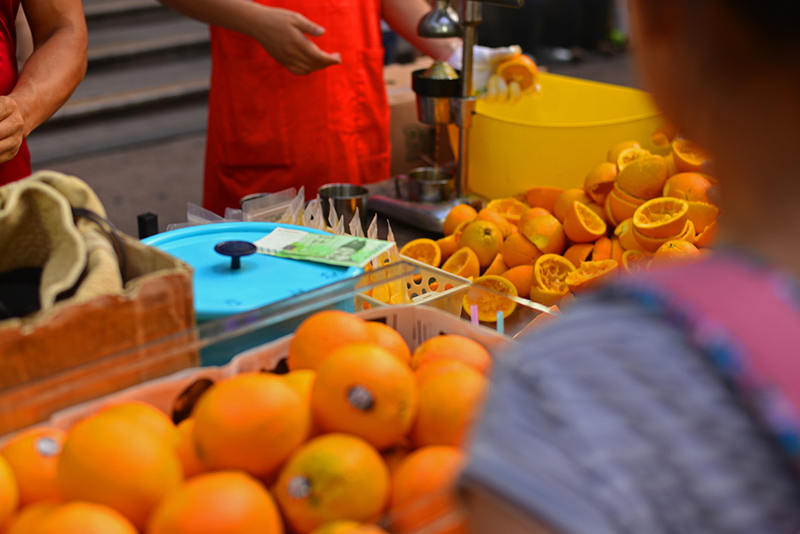 There is a wide variety of flavors ranging from watermelon to lychee. Have you been to South Korea? Which is your favorite street snack? I don’t know if I’m brave enough to try the pig’s feet, but the tteokbokki looks appetizing. I wonder if I can find it here in the States. Great post! I think you will be able to find some of these snacks in the States. They may even sell some of the ingredients needed to cook it yourself in the Korean supermarkets. I also think the taste might be slightly different from the original, because usually people tent to change and adjust their authentic cooking to the local preferences. The french fry covered sausages were my favorite … talk about killing two birds with one stone!